Justice Scalia, who had flown to the Texas resort early Friday, said he was going to turn in for the night, and went to the property’s presidential suite. 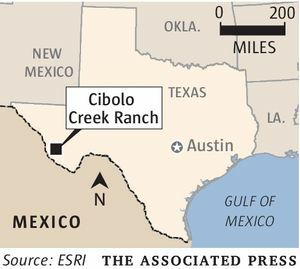 After Scalia did not appear for a morning excursion, the owner of Cibolo Creek Ranch went to his room. The veil of privacy was lifted Saturday off a remote West Texas ranch where Supreme Court Justice Antonin Scalia died suddenly. Cibolo Creek Ranch, a luxury compound built around three 19th-century forts, has played host to movie stars and European royalty lured by the beauty of the desert. Now, it will be known as the place where Scalia, a firebrand conservative whose vacancy on the Supreme Court launched an immediate political fight, spent his final hours. It was Scalia’s first visit to the storied ranch, and his death is already becoming part of the lore at Cibolo Creek. The 30,000-acre resort, less than an hour from the Mexican border crossing at Ojinaga, is tucked into the Chinati Mountains, 33 miles south of Marfa, Texas, and 150 miles southeast of El Paso, the last several miles on a dirt road. Guests can organize bird hunts — pheasant and chukar are plentiful on the property — as well as pursue bigger game, from deer and elk to buffalo, javelinas and mountain lions. The area is home to more than 500 species of birds, as well as 18 species of bats. “Tread lightly, and you’re likely to see more than a few species of wildlife, including the American buffalo, Carmen mountains white-tailed deer, mule deer, elk, aoudad, coyotes, black bears, javelinas, mountain lions and bobcats/ringtail cats, along with domestic livestock grazing in our pastures,” the ranch website says. For the well-heeled, getting to the ranch is convenient by private jet: 4 miles from the main office, it offers a private airport. “It’s a far West Texas, Big Bend landscape,” said José Rodriguez, a Texas state senator and a Democrat from El Paso who has been to the ranch. The combination of convenience and privacy has attracted celebrities, reportedly including Mick Jagger, Jerry Hall, Bruce Willis and Tommy Lee Jones. Jones used the property, located inside the crater of an extinct volcano, to shoot scenes for his 2005 film, “The Three Burials of Melquiades Estrada,” according to IMDB.com. A tabloid-worthy legal brawl adds to the resort’s Hollywood allure. In 2010, the ranch sued actor Randy Quaid for an unpaid bill totaling $24,859 after a 10-month stay. Hollywood figures are among a wider group of international jet-setters who frequent the ranch, once featured in Vogue magazine, where rooms can cost above $500 per night. The ranch is named after a Spanish term for bison used in the Old West, the era that most informs the rustic atmosphere of the resort. In addition to the old forts, which have been converted to luxury accommodations, the compound is composed of low-lying buildings surrounded by stone-built walls that give way to desert scrub. Poindexter obtained the property in 1988 and began extensively renovating the forts and outbuildings. A third-generation Texan, he runs a Houston-based manufacturing company, J.B. Poindexter & Co. and is a leader in the Order of St. Hubertus, the 17th-century hunting society whose members met at the resort in 2010. Poindexter has occasionally made political donations to Democrats, according to the Federal Election Commission. In 2009, President Obama presented a Presidential Unit Citation, the highest military honor for a U.S. military unit, to a force commanded by Poindexter in Vietnam. Poindexter recalled how, after Scalia — a Trenton, N.J., native who spent his career on the East Coast — arrived about noon on Friday, he joined the other guests on a successful quail hunt. He didn’t recall what the justice ate, except that it wasn’t steak. “He stood up and said he was tired, he had had a long week and he would see us in the morning,” he said. When Scalia, 79, failed to appear for a morning excursion at 8 a.m. Saturday, Poindexter became concerned and went to his room, which has its own outdoor fire pit and a wall of windows overlooking the 22-room adobe ranch hotel, a lake and surrounding peaks. “I had not seen him, and everyone else was up. I knocked loudly,“ Poindexter said. But Scalia was in a large room, the “El Presidente” suite, and the owner figured that perhaps the justice couldn’t hear him. “I was worried I was going to find something very tragic,” he said. There he spotted Scalia, still in his pajamas. “He was in perfect repose in his bed as if he was taking a nap. His face wasn’t contorted or anything,” Poindexter said. 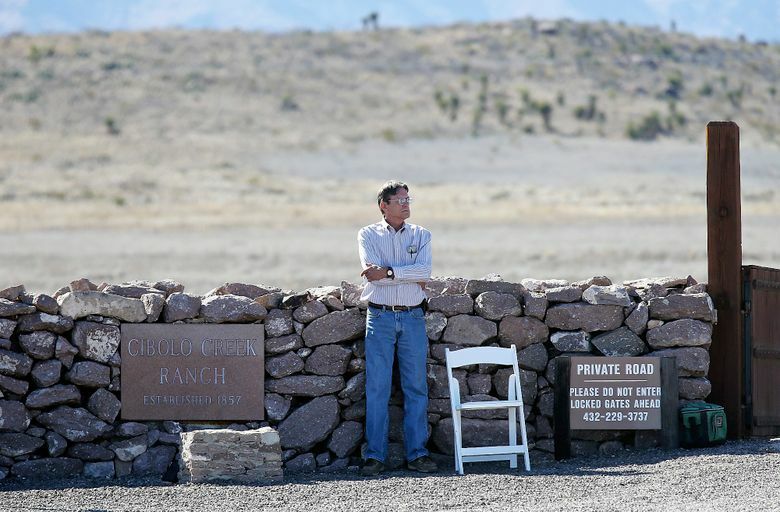 After Scalia’s body was found, the ranch alerted the U.S. Marshals Service, which is responsible for protecting the justices when they travel outside Washington, although Van Etten had not noticed them around Scalia at the ranch. “He was very unassuming. He didn’t want his entourage of marshals to stay here with him,” Van Etten said. He said they also later alerted a Catholic priest, the Rev. Mike Alcuino from nearby Presidio, who arrived to administer last rites to the justice, a devout Catholic. Poindexter had invited Scalia to bring his son, and when the son couldn’t come at the last minute, the justice brought an attorney friend instead, who alerted the family to his death, Van Etten said. A gray hearse arrived Saturday — a decoy, Van Etten said, to distract the news media. It wasn’t until about midnight that a van and police arrived to take the body away. The family was handling funeral arrangements Sunday, he said.